Successfully Added TC60 10 Port USB Charging Station - 60W 12A, Intelligent Charging, Worldwide AC Input to your Shopping Cart. With the vast number of USB powered devices we use, having a dedicated charging station is a necessity and a real life safer. Rather than using up a separate wall socket for each and every device this dedicated charging station can handle the power needs of 10 USB devices. With a desktop USB charging station like the TC60 you can reduce clutter and keep multiple devices charged. This 60 Watt charging solution lets you rack up a number of devices and with all of them in one place you'll never forget where you put your phone, tablet or music player. The charger boast an incredible 10 ports and with its 60 Watt 12 A maximum output it can easily charge up to 4 tablets and 6 phones simultaneously. 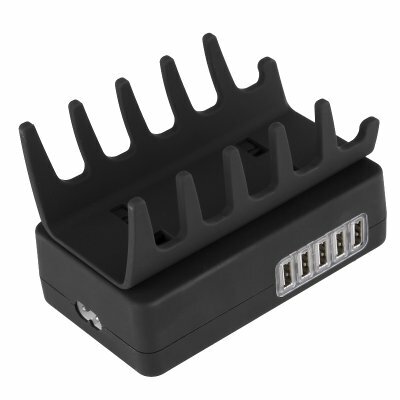 Considering its powerful output the TC60 10 port USB charging hub is remarkably compact so you can easily pack it with you on business trips or holidays. A worldwide AC 100 to 240V 50/60Hz input voltage means it's even suited to international travel so you won't need multiple plug adapters for all your gizmos when traveling overseas. The TC60 10 port USB Charging station comes with 12 months warranty, brought to you by the leader in electronic devices as well as wholesale USB gadgets and chargers..
Smart IC Technology: Can automatically recognize your devices, and distribute the best charge to each charging device individually and simultaneously.